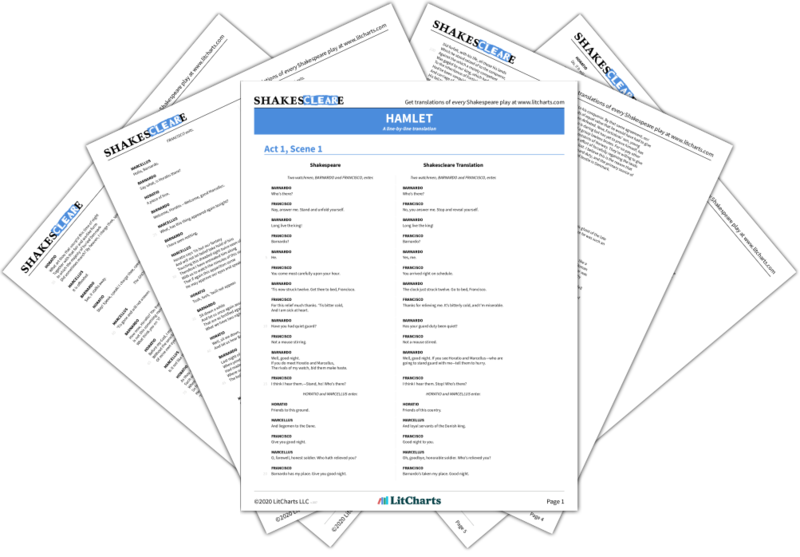 Instant downloads of all 946 LitChart PDFs (including Hamlet). New! Understand every line of Hamlet. 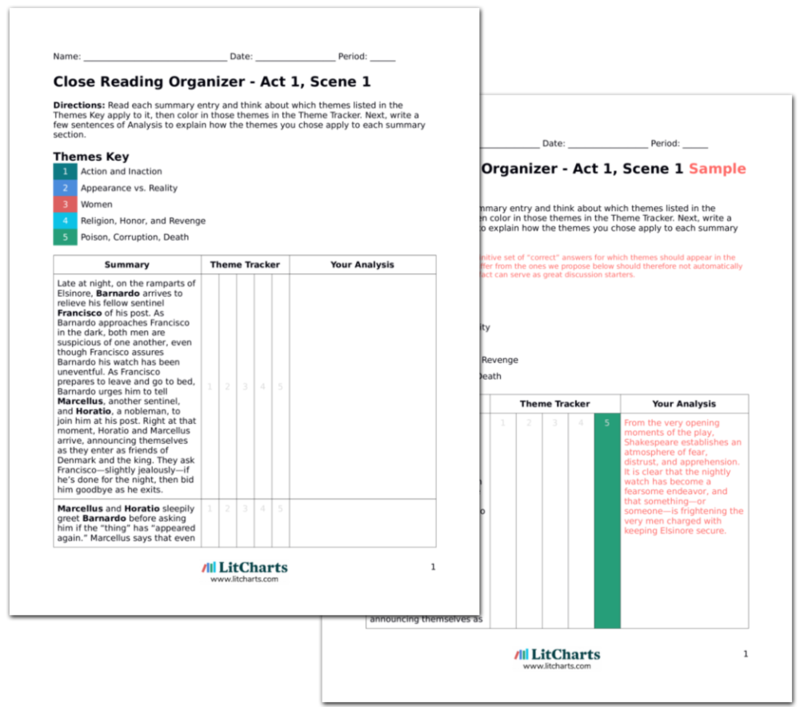 LitCharts assigns a color and icon to each theme in Hamlet, which you can use to track the themes throughout the work. Every society is defined by its codes of conduct—its rules about how to act and behave. There are many scenes in Hamlet when one person tells another how to act: Claudius lectures Hamlet on the proper show of grief; Polonius advises Laertes on practical rules for getting by at university in France; Hamlet constantly lectures himself on what he should be doing. In Hamlet, the codes of conduct are largely defined by religion and an aristocratic code that demands honor and revenge if honor has been soiled. But as Hamlet actually begins to pursue revenge against Claudius, he discovers that the codes of conduct themselves don't fit together. Religion actually opposes revenge, which would mean that taking revenge could endanger Hamlet's own soul. In other words, Hamlet discovers that the codes of conduct on which society is founded are contradictory. In such a world, Hamlet suggests, the reasons for revenge become muddy, and the idea of justice confused. The ThemeTracker below shows where, and to what degree, the theme of Religion, Honor, and Revenge appears in each scene of Hamlet. Click or tap on any chapter to read its Summary & Analysis. 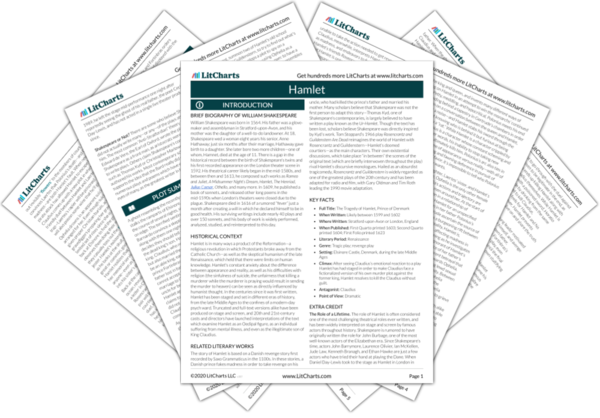 Get the entire Hamlet LitChart as a printable PDF. Below you will find the important quotes in Hamlet related to the theme of Religion, Honor, and Revenge. 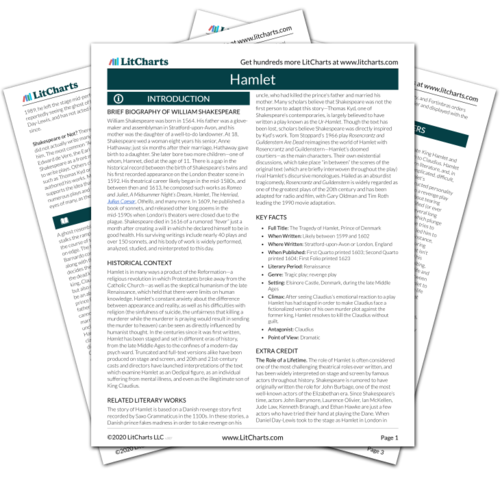 Unlock explanations and citation info for this and every other Hamlet quote. I could be bounded in a nutshell, and count myself a king of infinite space, were it not that I have bad dreams. What a piece of work is a man! How noble in reason! how infinite in faculty! in form, in moving, how express and admirable! in action how like an angel! in apprehension how like a god! the beauty of the world! the paragon of animals! And yet, to me, what is this quintessence of dust? Wherein I'll catch the conscience of the king. We defy augury; there's a special providence in the fall of a sparrow. If it be now, 'tis not to come; if it be not to come, it will be now; if it be not now, yet it will come: the readiness is all. Florman, Ben. "Hamlet Themes: Religion, Honor, and Revenge." LitCharts. LitCharts LLC, 22 Jul 2013. Web. 20 Apr 2019. Florman, Ben. "Hamlet Themes: Religion, Honor, and Revenge." LitCharts LLC, July 22, 2013. Retrieved April 20, 2019. https://www.litcharts.com/lit/hamlet/themes/religion-honor-and-revenge.